The fall weather has put me in the mood for some comfort food, especially the crumbly, crusty type. Pies aside, I decided my biscuit-making skills could use a bit of work, and took some baking soda, flour, and butter to task. I didn't have any bacon, ham, or sausage (plus it was 10:00 at night), so I decided to add some cheddar to the biscuits to make them more snackable on their own. 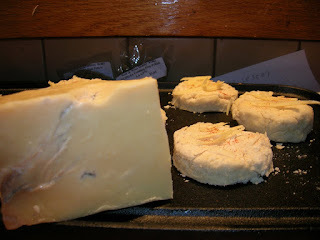 I chose an English farmhouse cheddar called Keen's, which is similar to Quicke's or Isle of Mull. What made this piece stand out to me was the blue veining in it. I've seen blue in cheddars and Cheshire before, along with the tradition of using an ice pick to drive air shafts into the wheel of cheddar to spread the mold, but none as crackling blue as this. So after making a dough of 3 cups flour, 4 tsp baking powder, 1 tsp salt, 1/2 tsp black pepper, and 6 tbsp butter, I mixed it with cold water and gently folded in the shredded cheddar. Even after baking at 425 (with a dash of cayenne on top) you could still get a blue tang right on the finish. 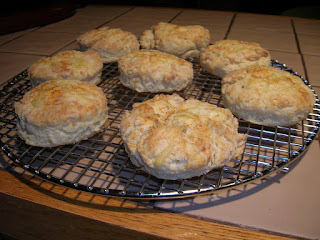 The texture of the biscuits was good, but may have benefited from more butter, or a mix of butter and shortening. Well, that's why I've got to retry and retaste again and again. This cheddar was a great choice, as I think a normal blue's water content would lead to gummy, pudding-like biscuits. While snacking on the biscuits, I was thinking about other Southern dishes and began to think about shrimp and grits. It's like breakfast, but made into a hearty dinner with shrimp, in a way that crabs and oatmeal could never be. But what if you made a pot of grits, then baked them (like making baked polenta, but baked them to act as a pie crust. Then make a quiche batter of eggs, milk, white cheddar, diced shallot, and seasoned with Old Bay. Toss in split shrimp, pour into your grits/dish and baked till the eggs were puffy and done. I think it would work, but I'm not sure how well the dish would hold, leftover-wise. So I'm probably restricted to testing it out when I have several people over for brunch. But hopefully that won't be so hard with the Holidays coming up.